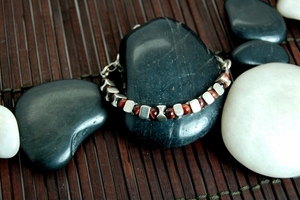 JKAT Vertebrae beads hug luminescent Red Tiger Eye beads in this easy to wear bracelet. Heavy gauge, solid sterling silver chain makes it easy to adjust the size of this bracelet. Clasp anywhere for your perfect fit up to 7.5".